Photo from Koster’s application for U.S. citizenship. 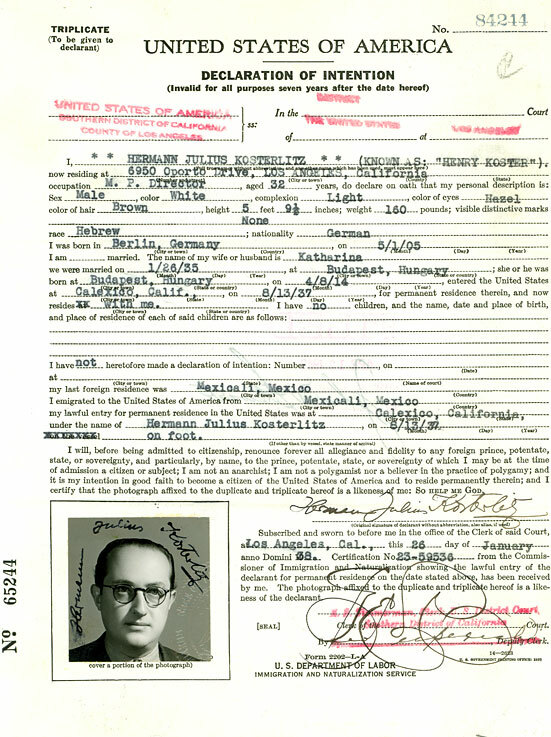 Henry Koster was born Herman Kosterlitz in Berlin, Germany, on May 1, 1905. His maternal grandfather was a famous operatic tenor, Julius Salomon (who died of tuberculosis in the 1880s). His father was a salesman of ladies unmentionables who left the family while Henry was at a young age, leaving him to support the family. He still managed to finish gymnasium (high school) in Berlin while working as a short-story writer and cartoonist. He was introduced to movies in 1910 when his Uncle Richard opened a movie theater in Berlin and his mother went there every day to play the piano to accompany the films. Henry went with her, day care being nonexistent then, and he had to sit for a couple of hours a day staring at the movie screen. He achieved success as a short-story writer at age 17, resulting in his being hired by a Berlin movie company as a scenarist. He became an assistant to director Curtis Bernhardt. Bernhardt became sick one day and asked Henry to direct (this was around 1931 or 1932). He had directed two films in Berlin for Aafa when Adolf Hitler came to power. He was in the midst of directing a film, DAS HÄSSLICHE MÄDCHEN, at that point, and having already been the victim of anti-Semitism, he knew he had to leave Germany, and soon. Any hesitation he may have had about leaving the country was erased when, at a bank on his lunch hour one day, a Nazi SA officer insulted him, and Henry hit the Nazi so hard he knocked him out. He proceeded to go directly to the railroad station and took a train for France. Upon arriving in France he was rehired by Bernhardt (who had left earlier). Eventually Henry went to Budapest and met and married Kato Kiraly (1934). It was there he met producer Joe Pasternak, who represented Universal Pictures in Europe, and directed four films for him. In 1936 he was signed to a contract with Universal and brought to Hollywood with Pasternak, several other refugees and his wife. At first he had some troubles at the studio (he didn’t speak English), but eventually convinced Universal to let him make Three Smart Girls (1936) with Deanna Durbin and coached Durbin, who was 14 years old. The picture was a huge success and pulled Universal from the verge of bankruptcy. His second film, One Hundred Men and a Girl (1937) with Durbin and Leopold Stokowski, put Universal, Durbin, Pasternak and himself on top. He went on to do numerous musicals and family comedies during the late 1930s and early 1940s, many with Betty Grable, Durbin and other musical stars of the era. He stayed at Universal until 1941 or so, then worked for MGM and around 1948 moved over to 20th Century-Fox. He was nominated for an Academy Award for The Bishop’s Wife (1947). In 1950 he directed what was his biggest success to date, the James Stewart comedy Harvey (1950), but, although many in the industry thought it would be nominated for Best Picture, it wasn’t. He directed the first American film in which Richard Burton appeared, My Cousin Rachel (1952), then was assigned by 20th Century-Fox to direct its first CinemaScope picture, The Robe (1953), also with Burton, which was a tremendous success. He directed a few more costume dramas, such as Desirée, then went back to family comedies and musicals, such as Flower Drum Song (1961) for Universal. After he finished The Singing Nun (1966) he retired from the film business to Leisure Village, Camarillo, California, to indulge his lifelong interest in painting. He did a series of portraits of the movie stars with whom he worked. 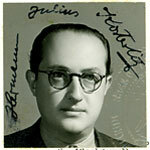 Henry Koster was a founding member of the European Film Fund.